Discussion in 'Forum and Server Announcements' started by BiGUNMAN, Dec 24, 2016. Hi, it's been a while since our last update. We haven't disappeared though! This is our Mega Update! Leveling system, level up and get all kinds of new perks. A coin shop, finally, purchase many more items for coins then before! Improved claiming (teleport to claims)! Rentable shop at spawn (for chestshops). Vote reward improvements (claim teleports, enchantment scrolls, etc). Those images are just sneak peaks of what's to come! I can't ruin it all for you guys. As time goes on, you'll start to see more features, such as Public Warps which we've been testing for a while now, as well as more Claiming improvements, and new ways to get enchantment books! You can still play the old Survival using /survival8, although we will discontinue it later this new year. 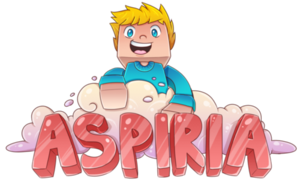 We've spent a tremendous amount of time on this update (over 100 hours) so I hope you guys enjoy the new Aspiria. However @BiGUNMAN , we lost a lot of players in the resets and updates. You devs should focus on advertising the server, or maybe inflict a reward system so the players do advertising for you, the server list site doesn't seem to be adding much newcomers. Share the server on social media for coins / rewards..
Also, I really feel like there's a need for a new trailer, the current one doesn't really explain anything.. It just shows off a few pictures of the hub, spams out the logo in the middle and plays music that doesn't really fit the scenario.